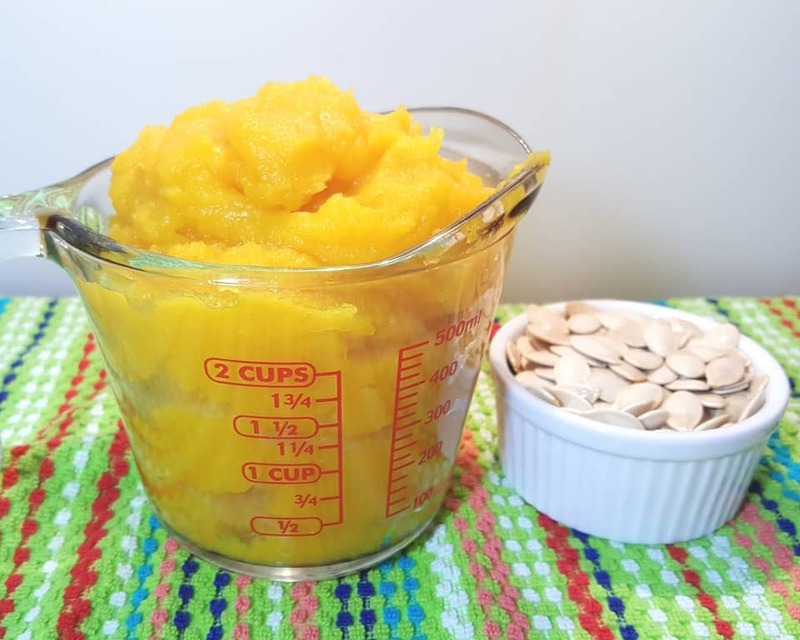 Pressure Cooker Sugar Pie Pumpkin Puree is healthier and tastes a million times better than the canned stuff and is so simple to make. Fresh Pureed Pumpkin is so much better than the canned stuff. It is also super simple to make in the Pressure Cooker. Try some fresh Pressure Cooker Sugar Pie Pumpkin Puree in my Pressure Cooker Bourbon Pumpkin Pie Cheesecake (“Pake”), rather than a can of the stuff. 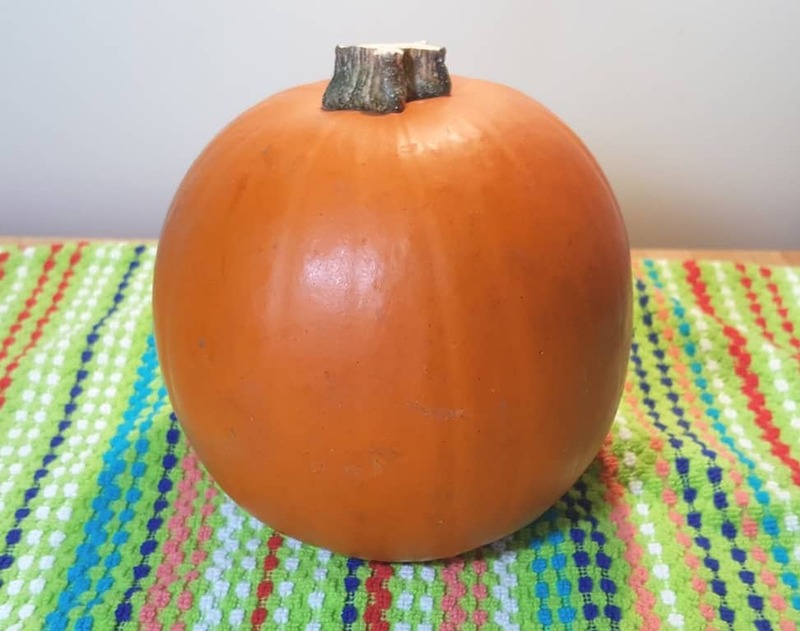 That’s it, just a Pie Pumpkin, also called a Sugar Pumpkin. 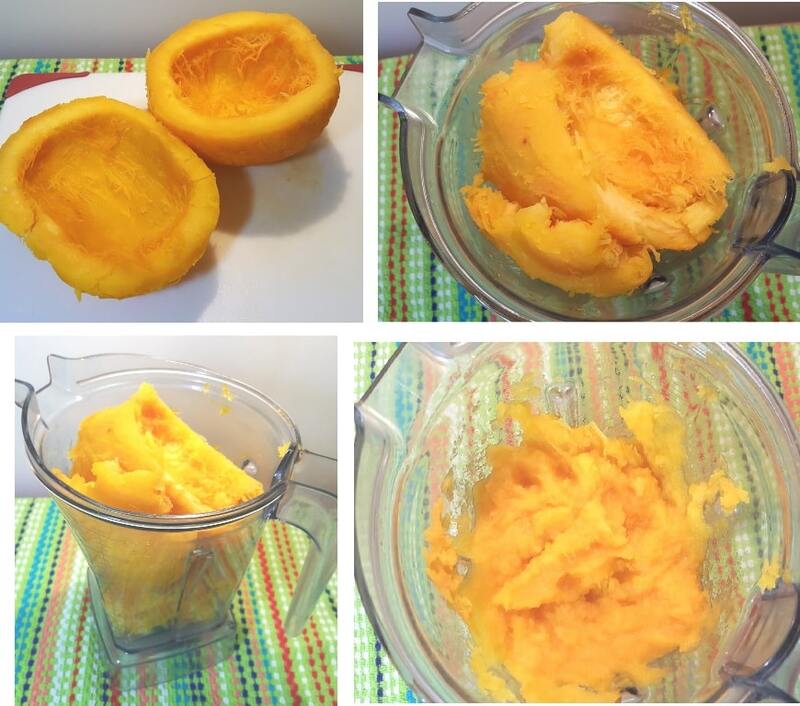 You can use other winter squash as well to make a Puree. Add some water and a trivet to your Pressure Cooker cooking pot. No need to cut up the Pie Pumpkin or remove the steam if it fits. 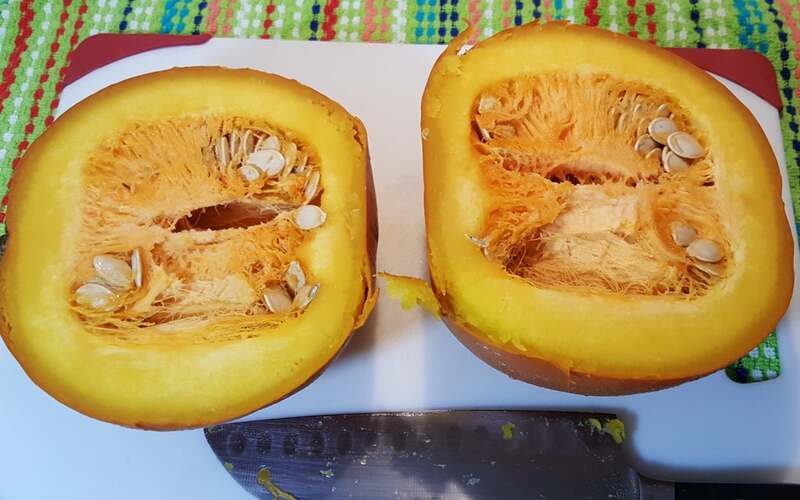 If you want to do several Pie Pumpkins at once, just cut them in half or in quarters and place them in your Pressure Cooker. I find it easier to remove the guts after cooking. 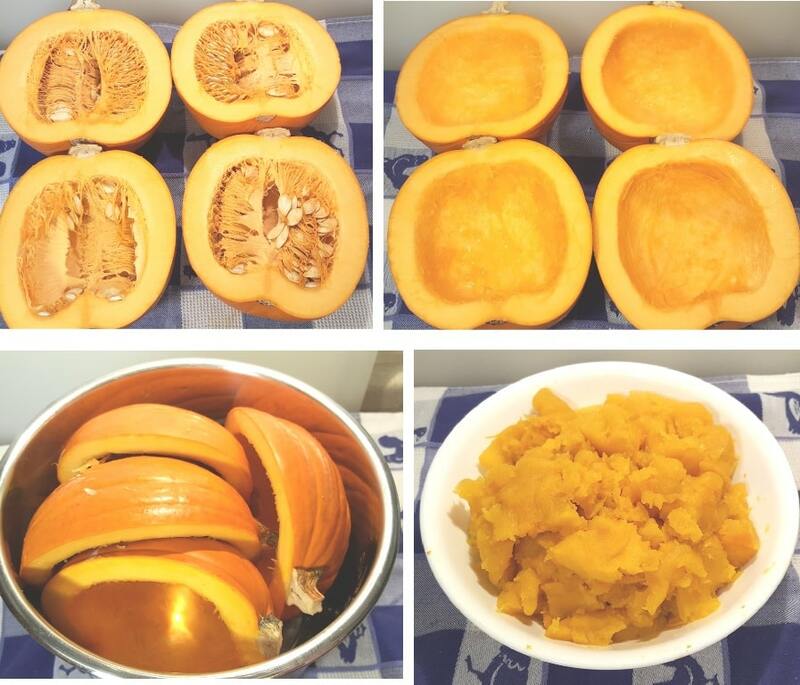 However, if you want to cook multiple pumpkins at the same time, slice them up and remove the inside. If I cut these into quarters, I could have fit more into my Pressure Cooker. 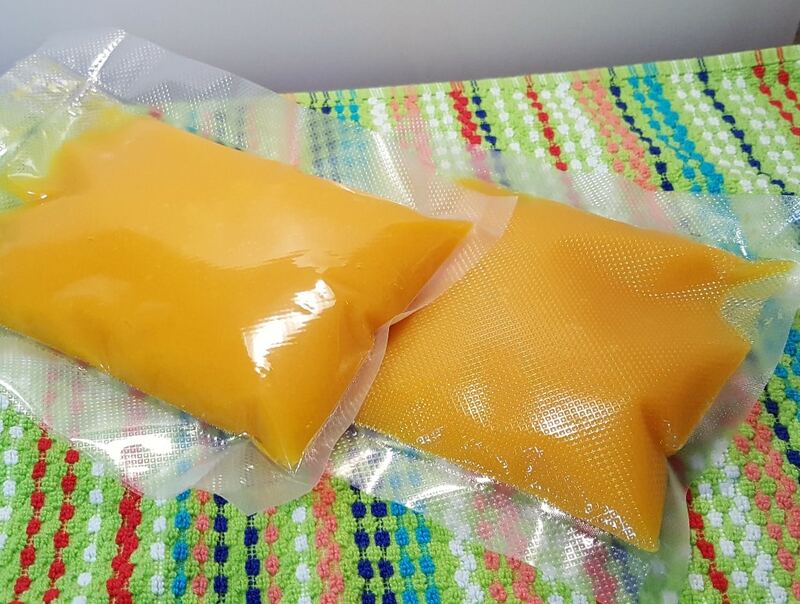 The only draw back to processing the Pumpkins this way, is that you will have moisture in the Puree, rather than a drier meat. 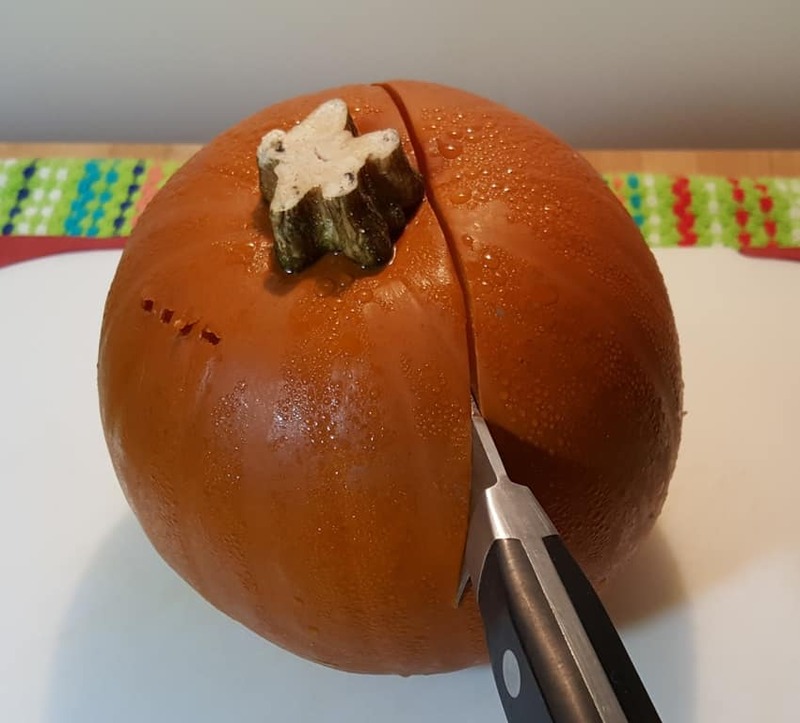 Poke the Pie Pumpkin with a fork and if it goes in easy with just a slight bit of tug, that is good. I like to undercook my Pressure Cooker Sugar Pie Pumpkin Puree, just a bit. Chances are, the Puree is going to be used in another recipe, so I don’t want my Puree overly processed. I like for it to cook the rest of the way in my recipe. We have to take a knife to him, so, take a deep breath and cut this little baby in half. See all those wonderful Pumpkin Seeds? We’ll make Toasted Cinnamon Sugar Pumpkin Seeds later, using the Pressure Cooker and the Air Fryer! 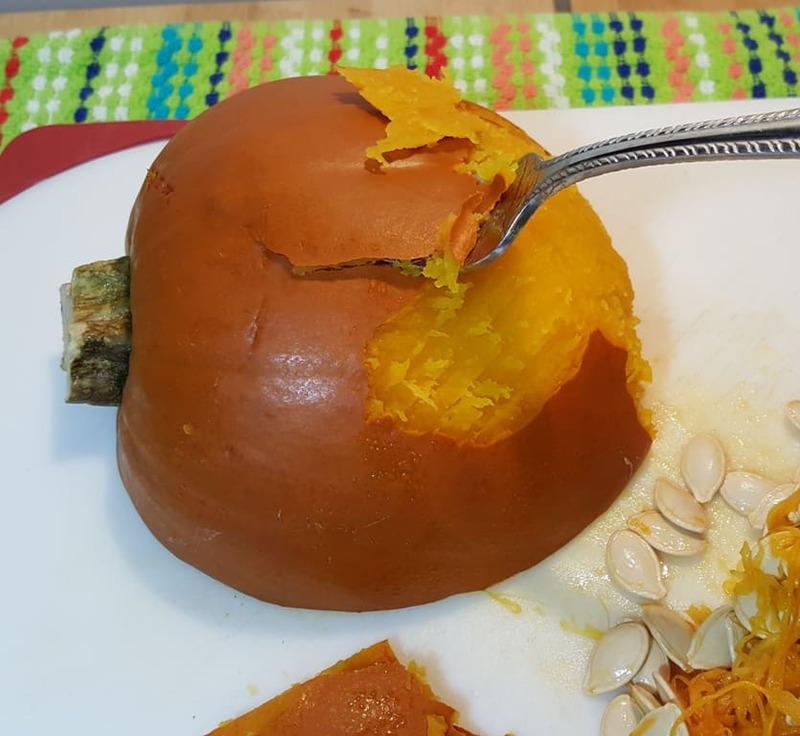 Take a spoon or a fork and just scoop out the guts of the Pie Pumpkin. It should come out pretty quickly. Use a fork or your fingers and just pull off the skin. 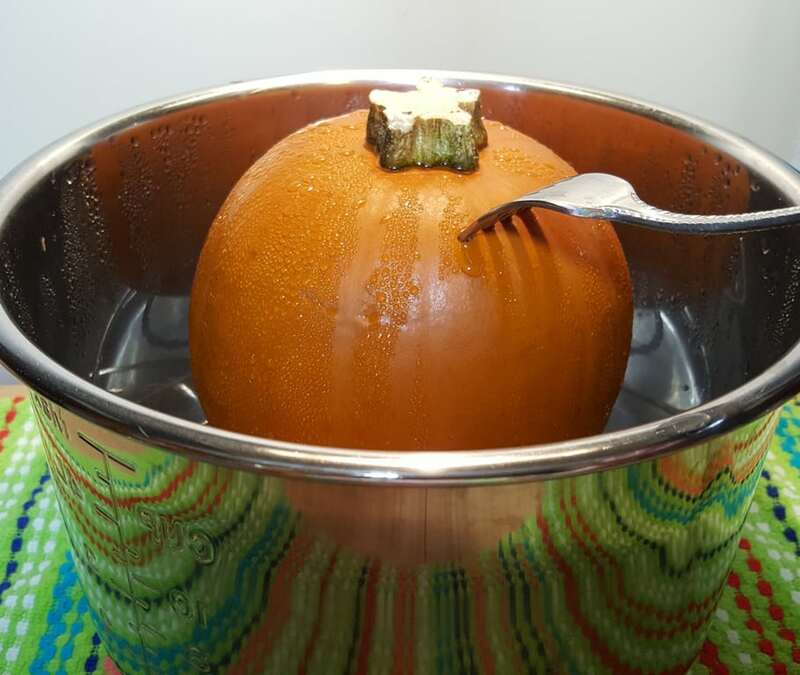 The Pressure Cooker Sugar Pie Pumpkin is practically peeling itself! Any way you want to process the Pressure Cooker Sugar Pie Pumpkin Puree, is fine. You don’t really even need to blend it, if you don’t want to process. I used my VitaMix Creations, but an Immersion Blender, Food Processor, etc., will also work. The VitaMix Creations and Immersion Blender will actually puree the Pumpkin. The Food Processor will just break it up really well. I usually process about 15 Sugar Pie Pumpkins at a time, since I use the Pumpkin Puree throughout the year. I love, love, love Pumpkin, anything Pumpkin, I love it, so be on the look out for recipes. I have a ton of recipes that I have made over the years and now since I have a blog, I will need to properly photograph them and write out the recipes for you to enjoy. Here is a sneak peak….in the next few days, I will be posting my yummy Pressure Cooker Pumpkin Curry Chicken with Thai Triple Coconut Rice. 🙂 It is soooo good! I used a three pound Sugar Pie Pumpkin for this demonstration. It yielded 24 ounces of Pure Pumpkin Puree. And, don’t forget about those seeds. Try my Pressure Cooker Buttermilk Pumpkin Bread. How about some Pumpkin Muffin Cheesecake Bites? Or, Pressure Cooker Pumpkin Apple Butter? As I said above, I process a lot of this Pressure Cooker Sugar Pie Pumpkin Puree, to last me all year long. I am really digging my Foodsaver Automatic Vacuum System these days. Since writing for this blog, I find myself left with a ton of leftover food and the Foodsaver allows me to store it all in my freezer with minimal packaging, which is terrific. If you are on the fence about getting one, because the Foodsaver bags are pricey….check this out. These Commercial Bargains Jumbo 11″ x 50′ Vacuum Sealer Saver Bags are super cheap and work as good as the original Foodsaver bags. A three pound pumpkin yields 24 ounces of Pure Pumpkin Puree. It is about 8 ounces per pound, approximately. Make sure you take into account the stem when figuring a larger or smaller size Pie Pumpkin. Wash Pie Pumpkin. Cut down stem, if needed. 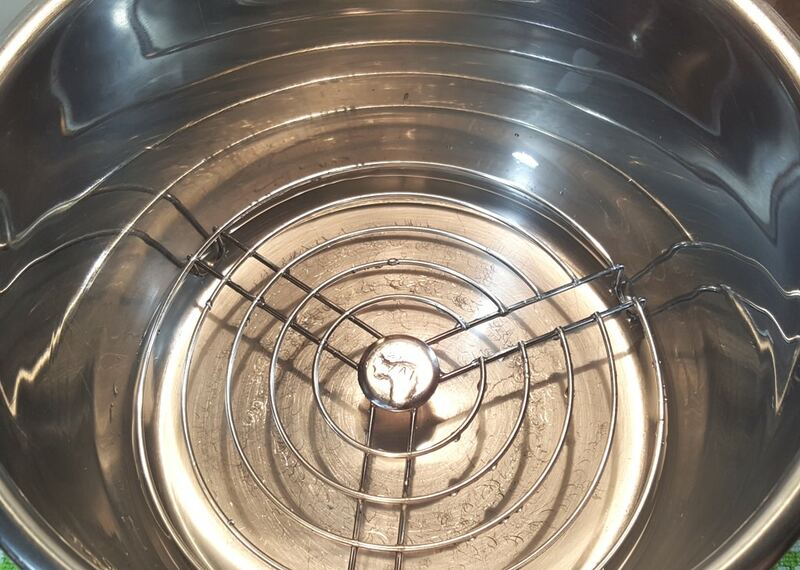 Add water to your Pressure Cooker cooking pot and place a trivet on top. Place your Pie Pumpkin on trivet. Lock on lid and close Pressure Valve. Cook on High Pressure for 8 minutes. When Beep sounds, allow a full Natural Pressure Release. 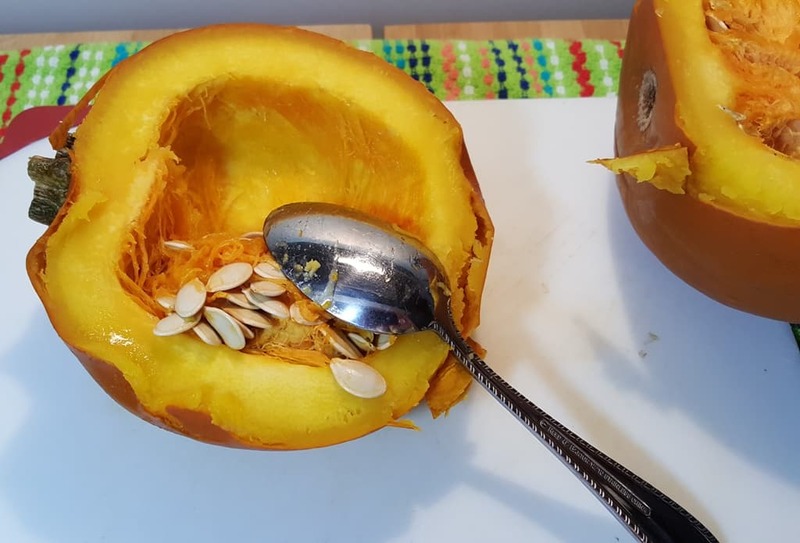 Remove Pumpkin, cut in half and scoop out the seeds and set aside to toast. Scoop out the flesh and place in Food Processor or Blender and process until smooth. One 3 pound Pie Pumpkin yields 24 ounces of Pure Pumpkin Puree. If cooking halved or quartered Pie Pumpkins, cook for 5 minutes, with a Natural Pressure Release. 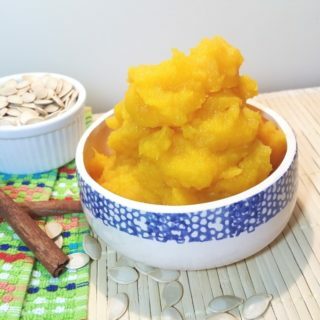 PIN this Pressure Cooker Sugar Pie Pumpkin Puree! I made your sugar pie pumpkin puree today. It was so easy and fell out of the shell. I divided up and marked with amounts for desserts I’m planning to make. My only problem was I had to cut in half and one slipped down the side of my trivet. I’m planning to get the dessert pans, Will it work to set the halves in one of those pans to keep from dropping in the water? 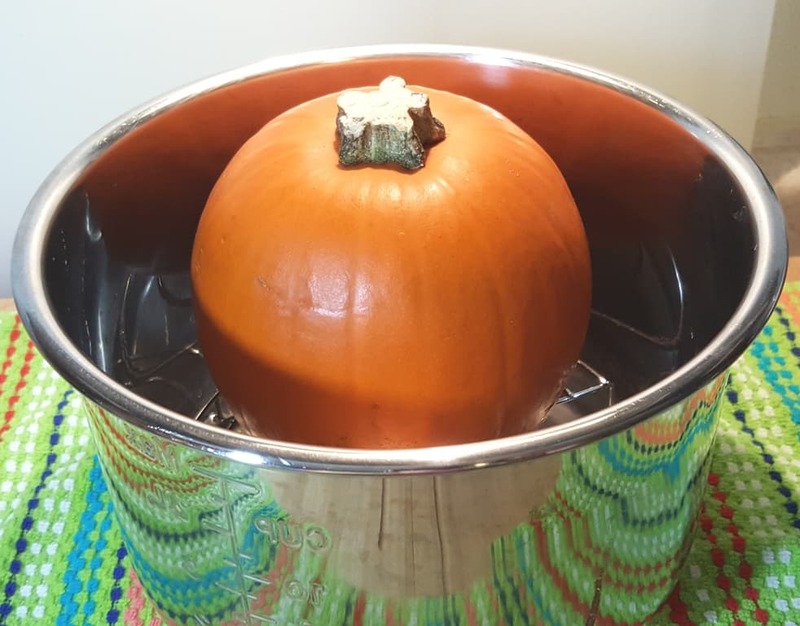 No problem with putting the pumpkins inside of the pan…..I actually prefer not to have water get into them, so they are drier. I also love anything pumpkin. Do you have any recipes? How much of this do I use for pie or muffins? I would your recipes. Thanks for sharing recipes using your IP. 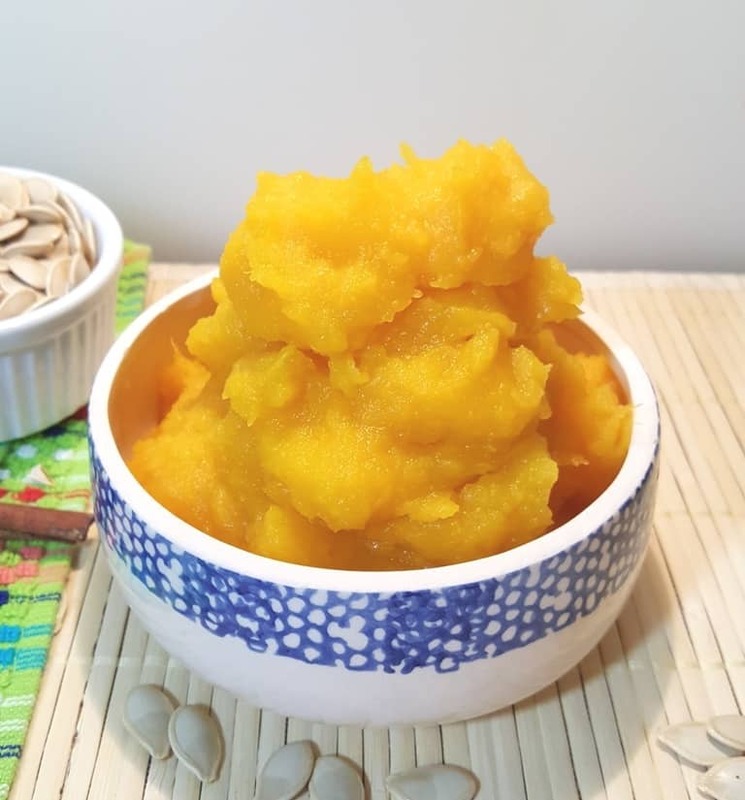 This is absolutely the easiest I have processed pumpkin. Usually we wrap our pumpkin in foil and BBq for two hours, cool and process. This took less than an hour from cold water to purée to cleanup.